Mother Nature has created an amazing number of ways for plants to survive harsh conditions. Many plants have developed elaborate food storage systems. Corms, rhizomes, tubers, tuberous roots and bulbs are either swollen stem or root systems by which plants store food. Most people collectively refer to all of these systems as "bulbs." Think of bulbs as the "camels" of the plant world. Bloom times of flowering bulbs. Flower bulbs can be divided into two categories; spring-blooming bulbs, such as tulips, or summer-blooming bulbs, such as gladiolus. The spring-blooming bulbs are often then divided into early-spring, mid-spring or late-spring blooming varieties. Glory of the Snow Chionodoxa sp. As with most garden plants starting with good soil is the key to success. A general rule of thumb for planting depth is to plant bulbs 3 times as deep as the bulb is wide. For instance, a 2-inch wide bulb would be planted 6 inches deep. Dig your hole a couple of inches deeper and add organic matter, lime or a good quality bulb food. 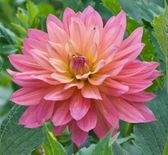 This will give you bigger, more vigorous blooms. Plant your bulbs with the pointy side up (noses in the air). If you aren't quite sure which end is up plant them side-ways...Mother Nature will do the rest. The best time to plant spring-blooming bulbs is in the fall after a good hard freeze but before the ground is frozen solid. Warm soil temperatures and cool air will encourage root growth but not top growth. Most bulbs prefer a sunny location. Early spring bulbs can also be planted under trees as the bulbs will come up before the trees leaf out in the spring. Remember to leave the dying foliage on the plant as this is how the bulb stores energy to produce next year's flowers! Create a meadow in your garden by planting spring bulbs directly into your lawn! When it is cold and snowy outside what could be cheerier than a pot of blooming tulips or hyacinths? Making bulbs flower inside, not at their normal bloom time, is called "forcing." The best bulbs for forcing are the spring-blooming bulbs like daffodils, hyacinths, tulips, and crocus. The first thing to do is to purchase top-size, good-quality bulbs from your local garden center. Flower bulbs already contain everything they need in order to grow, all we have to do is to trick them into doing it. Since bulbs need cool soil temperatures in order to produce roots it is our job to fool them into thinking that they have experienced a cold winter. This is called "chilling" your bulbs. You can "chill" your bulbs either before or after you have planted them. Bulbs must be chilled 12-14 weeks. Some bulbs are labeled as "pre-chilled." Pre-chilled bulbs still need an additional 10 weeks of chilling in order to bloom well. Stunted or poorly developed flowers means that they were not chilled long enough. You can chill your bulbs either outside, in a cold garage or cold frame or in the vegetable bin of your refrigerator. Next, we need to select the proper type of pot. The best containers for forcing are shallow pots called 'bulb pans' or 'azalea pots.' These pots are not as deep as a regular flower pot. Your container must have drainage but can be either plastic, clay or ceramic. Remember to use a good quality potting mix. Bulbs forced in soil may be planted outside after they have bloomed. Bulbs can also be forced with only gravel and water but these bulbs should be discarded after flowering. Bulbs can be planted very close, even touching each other, in pots. 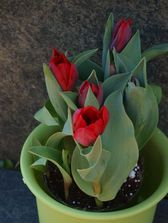 When planting tulips place their flat side out towards the rim of the pot. This way the first leaves that emerge will drape attractively over the rim of the pot. You can plant several types of bulbs together for a "miniature" garden effect. Once planted, water your bulbs well before chilling. Your bulbs must be chilled between 35-48 degrees F. If chilling your bulbs potted in your refrigerator, place the pot in a plastic bag to prevent dessication. After 12-14 weeks bring your pot indoors into a warm location and water. No fertilizer is needed at this time. Once you begin to see growth move your pot to a sunny location. In about 3-4 weeks you will then have a blooming pot of spring flowers. If you are the impatient sort, try forcing Paperwhite narcissus or Amaryllis bulbs indoors. These warm climate bulbs do not need to be chilled, thus saving you that 12-14 week waiting period! Information from: "Spring Bulbs for Indoor Forcing,"
Soil preparation is the same for both spring and summer-flowering bulbs. However, planting time and depth are different. The best time to plant summer-flowering bulbs is in spring after the last chance of frost. The chart below lists the planting depth for some common summer-flowering bulbs. Caladium - 1 inch deep, when 70 - 80 degrees F. Shaded location. Elephant's Ear - 1-3 inches deep, prefers ample water and high humidity. 'Elephant Ear' is a common name given to plants in the Alocasia & Colocasia plant families. 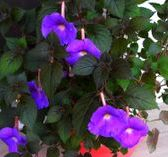 These plants thrive in hot humid locations and can be planted in full sun or bright shade. They prefer a deep, rich, evenly moist soil and dislike windy, dry sites. Elephant Ears anchor this flower bed. Shelter Gardens, Columbia, Missouri. The best time to plant these dramatic plants outdoors is when the soil temperature is 60 degrees F. or warmer. Night temperatures should be above 55 degrees F. In northern states you can start your Elephant Ear bulbs indoors by planting them in containers with a good quality potting mix. Elephant Ear bulbs should be planted shallowly with the top of the bulb barely showing at the surface. The narrow tapered end of the bulb is the top. 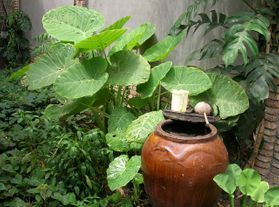 Keep your Elephant Ear well watered and fertilize once a month with a liquid or granual type fertilizer. Dig your bulbs up in the fall before the first fall frost. Clean them well and store them in dry peat moss or vermiculite at around 60 degrees F. Next spring bring them out and start the whole process again. Elephant Ears can also be grown indoors in a container provided you have a bright sunny window. Caution! Spider mites love Elephant Ears when grown inside, so spray with a general houseplant insecticide labeled for spider mites. In areas with cold winters, you can carry the beauty of summer-blooming bulbs from year to year by taking a little time each fall to dig up these bulbs, a process called "lifting." Some plants that will need to be brought in are cannas, tuberous begonias, dahlias, gladiolus and calla lilies. Work all around the sides of a clump of bulbs with a spading fork, then lift the soil and the bulbs together. Break up the clumps and carefully separate the bulbs with your fingers. Clip off the foliage and remove all soil clinging to the bulbs (except those which must be stored with soil on the roots). Simply brush it off, if possible. Avoid hosing it off. Allow the bulbs to dry. If the bulbs are stored damp, they are apt to rot. Dust the bulbs with a fungicide such as Dusting Sulfur to prevent rot. Store in a container that can breathe, such as a basket, cardboard box, or paper bag. Pack in damp sphagnum moss or damp vermiculite, making sure the bulbs don't touch one another. Check the bulbs once every month or so. It may be necessary to move them to another location if the storage area is too warm (they'll start sprouting) or too cold. The following chart lists the temperatures at which summer bulbs should be stored. Store cool and dry. Dig when leaves turn yellow and let dry after digging. Start indoors in April. Dig 6 or 8 weeks after bloom. Store as gladiolus. Store like dahlias. Frequently sold as an autumn planted bulb, but not reliably winter hardy in the midwest. Dig when foliage turns yellow and cure with foliage. Remove foliage and store in sphagnum peat or vermiculite. Dig when foliage turns yellow or after frost has killed foliage. Cure with remaining foliage and store in sphagnum peat or vermiculite. Dig when foliage turns yellow or when foliage is damaged by frost. Store in sphagnum peat or vermiculite. Dig after frost has damaged foliage and allow foliage to dry a few days before digging. Dig carefully to avoid damage which will cause rotting. Store in sphagnum peat, vermiculite, or sand. Dig after frost has damaged or killed foliage. Dig carefully to avoid damage. Cure in high humidity to avoid dessication. Pack roots in vermiculite or sphagnum peat. Roots can be placed in plastic bags with small perforations or boxes and covered with vermiculite or peat. Dig 6 or 8 weeks after bloom or when frost kills foliage. Cure 2 to 3 weeks in a dry well-ventilated area at about 60-70 degrees F. Remove old corm and cormels. Store in labeled paper bags. May be stored in the pot or dig the tuberous roots and store like dahlias. May be started indoors again after 2 months storage. Dig before frost. Avoid breaking the heavy roots attached to the bulb. Store upside down in vermiculite or dry sand. Dig before freezing. Otherwise store and handle as gladiolus. Do not break corm cluster apart until spring. Dig after tops freeze and store in paper bags or in vermiculite. Dig 6 to 8 weeks after bloom or after frost. Cure and store like gladiolus. Dig after tops die or are killed by frost. Store in plastic bags with sand or vermiculite.